A paper entitled, “Some Ecological Factors influencing Control of Carpet Beetles and Clothes Moths” was presented before a meeting of the Pest Control Operators of California (PCOC) association on Feb. 26, 1946. Written by E. Gorton Linsley, University of California, Berkeley, it appeared in the July 1946 issue of Pests and Their Control — Pest Management Professional magazine’s legacy name. Carpet beetles (primarily Anthrenus spp.) and clothes moths (Tineola bisselliella) are only occasional invaders now, but in the 1940s they were much more pervasive. 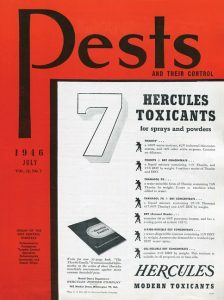 Back then, professionals usually turned to fumigation, but Dr. Linsley noted it “provided little more than temporary relief.” Rather, he said, infestations were coming from other pest problems, such as “bird nests under eaves or in tile roofs, honey bee nests in walls or chimneys [and] deserted hornet nests.” Later in the article, he noted that the spider web and nest of the southern black widow (Latrodectus mactans, although he did not include the southern distinction) consistently catch various beetle species. Delving into the behavior of the varied carpet beetle (A. verbasci) in particular, Dr. Linsley explained that the favorite foods of its larvae include dead insects and spiders — “a fact which accounts for their ravages in insect collection.” But the beetle also consumes animal hair, feathers and bee pollen, and all these items are regularly found in bird nests. Milled cereal is another favorite, he said. The article includes the author’s California-centric charts of which beetles and moths were found in what types of nests made by birds, stinging insects and southern black widow spiders. The charts, as well as the industry advertisements sprinkled throughout the original article’s five pages, can be viewed here in a PDF. They freeze a moment in time for our industry, where DDT is an everyday staple for readers, as is “Attaclay” to keep dust from clumping. 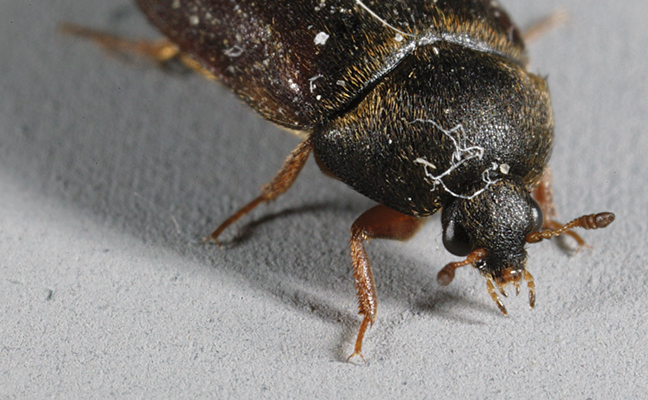 Nests of birds, rodents, insects and spiders harbor large numbers of carpet beetles and clothes moths. Nests about houses and other buildings are more apt to be heavily infested than those in the open. Such nests provide foci for household and warehouse infestation and may invalidate control efforts applied within the structure. Control programs should include destruction of nests at the close of the breeding season, before the onset of cool weather which may drive the insects indoors. A number of the carpet beetles require pollen for successful production of eggs and care should be taken not to bring these insects into the house on cut flowers. Such individuals, having mated and fed are more likely to provide the source of a serious infestation that [of] individuals which have reached maturity within the confines of the building. 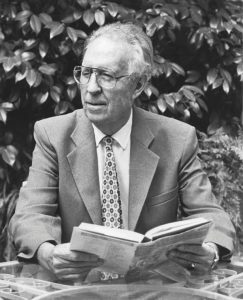 Entomologist Earle “Gort” Gorton Linsley (1910-2000) was named dean of the college of agricultural sciences at his alma mater, the University of California, Berkeley, in 1959, after serving as chair of the entomology and parasitology department. Dr. Linsley’s obituary noted he was committed to transforming the university’s agricultural college into what it’s known as today, the College of Natural Resources. He retired in 1974. Dr. Linsley was a renowned expert on Cerambycidae, which includes longhorn beetles. He wrote more than 400 scientific articles and books, and won several state-level awards for his research. Pelocoma linsleyi, a rain beetle, was named in his honor.